Forcepoint is pleased to release version 8.3.0 of the Forcepoint appliance infrastructure. Changes in this update improve every aspect of TRITON appliance form and function, and establish the foundation for future advances. Because of the scope of the changes, these release notes are lengthy. Is a single common architecture used by all TRITON appliance platforms: V-Series, X-Series, Forcepoint APX Virtual Appliance. Is a single common code base that delivers a more efficient and stable environment. Is a more secure environment. The common architecture and code base, in addition to platform hardening, reduce attack surfaces. Allows a single ISO/OVA/VHD to be used to install TRITON software on all TRITON appliance platforms. Quickly and easily supports new hardware and virtual appliance platforms. Quickly and easily supports TRITON product integration using a standardized data specification and calls to the TRITON appliance API. Maintains a clean separation between TRITON products and appliance code. There is no mixing of TRITON product code with TRITON appliance code. Uses LXC (Linux Containers) to host TRITON product modules, such as the core web protection module, web proxy module, core email module, and others. LXC replaces the former XEN and guests architecture. More efficient and flexible allocation, protection, control, and monitoring of system resources. An environment that more quickly and easily supports new Forcepoint technologies and appliance platforms. Includes a command-line interface (CLI), that supports all appliance configuration, maintenance, monitoring, and troubleshooting functions. See Command-line interface (CLI). Includes an appliance management REST API that supports all appliance functions. See TRITON appliance API. Uses CentOS 7.2 as the base operating system and with the TRITON AP-EMAIL container. Uses CentOS 6.8 in web protection solution containers. For detailed information about deploying any of the TRITON AP-DATA solutions on TRITON appliances, see the TRITON AP-DATA section of the Forcepoint documentation page. For detailed information about deploying TRITON AP-WEB Cloud with an i-Series appliance, see the Forcepoint i-Series Appliance section of the Forcepoint Documentation page. See the V-Series Appliance datasheet (PDF on the Forcepoint website) for specifications of the currently shipping model. Interface bonding: With TRITON AP-WEB and TRITON AP-EMAIL, interfaces P1 and E1 can be bonded, and interfaces P2 and E2 can be bonded. See the X-Series Appliance datasheet (PDF on the Forcepoint website) for specifications of the currently shipping model. All X-Series appliances come with 2 PowerConnect M6220 switches. Each supports 2 10Gb SFP+ ports. New for v8.3.0, Forcepoint APX Virtual Appliance certified with ESXi v6.0, and supported on v5.5 and other versions of 6.x. All TRITON AP-EMAIL VMware virtual appliances come with 4 virtual Ethernet interfaces. The policy mode Filtering only is not supported on VMware virtual appliances with version 8.3.0. All TRITON AP-WEB and Forcepoint Web Filter & Security VMware virtual appliances come with 4 virtual Ethernet interfaces. N — Reserved; Network Agent and Content Gateway decryption port mirror are not supported on VMware virtual appliances in v8.3.0. Dual Mode appliances are not supported with version 8.3.0 and higher. Either TRITON AP-EMAIL or the web protection solution must be migrated to a new appliance. For more information, see Dual Mode appliances. Forcepoint V5000 G2R2 Appliance customers may encounter a memory shortage after upgrading to version 8.2 or later. This issue is the result of newer versions of software requiring additional memory, and was only captured under a very heavy load. A DIMM Kit (2 x 8GB) is certified to expand the physical memory of the V5000 G2R2 Appliance. It is now generally available and recommended for V5000 G2R2 deployment moving to versions 8.2 and later. Please contact your sales representatives for purchase information. For more details, see the related Knowledge Base article and the DIMM Kit installation instructions. If you plan to upgrade from any version of 7.x to any version of 8.x, you should verify the full hardware platform model of the appliances you plan to upgrade. In some cases your hardware platform information is available on the Configuration > System page in the Appliance manager. Refer to the System Information box at the top of the page. This will tell you if you have a G3 or G4 appliance. However, for V10000 G2 and V5000 G2 machines, the summary does not indicate whether the appliance is an R1 or R2 model. If you have a G2 appliance, use the following steps to determine if it's R1 or R2 hardware. Record your appliance service tag numbers (STN). You can find the STN printed on the pull out tag on the front of the appliance, behind the bezel (if installed). The STN is a 7 character code (for example: 9DZTBQ1). Contact Forcepoint Technical Support and request assistance in identifying the full model version of your appliances. These measures harden all V-Series, X-Series, and Forcepoint APX Virtual Appliances. To view system logs in the CLI, use the 'show log' commands. All CLI access and command activity is recorded in an audit log. 2016-12-13 21:49:30,627 - INFO - appcli - Account admin, logged on from 10.64.161.8, entered view mode. 2016-12-13 21:49:59,042 - INFO - authentication - 13039 - User <admin> attempting to log into API. 2016-12-13 21:49:59,102 - INFO - common - Account admin, logged on from 10.64.161.8, entered config mode. Version 8.3 does not support single appliances that host both TRITON AP-EMAIL and TRITON AP-WEB or Web Filter & Security. These appliances, known as Dual Mode appliances, have always been limited to the V-Series platform. The new TRITON appliance architecture streamlines and optimizes the allocation and supervision of platform resources and processes to provide the best performance for the hosted Forcepoint solution. Stability, scaling, and operating efficiencies all improve in the single mode environment. Before upgrading a Dual Mode appliance to v8.3, either the email or web module must be migrated to a new TRITON appliance. To ease the migration effort, special tools have been developed, and a special procedure is recommended. For details, see Upgrading V-Series Dual Mode Appliances to Version 8.3. Contact your Forcepoint account representative to learn about special promotions for Dual Mode deployments planning a v8.3 upgrade. 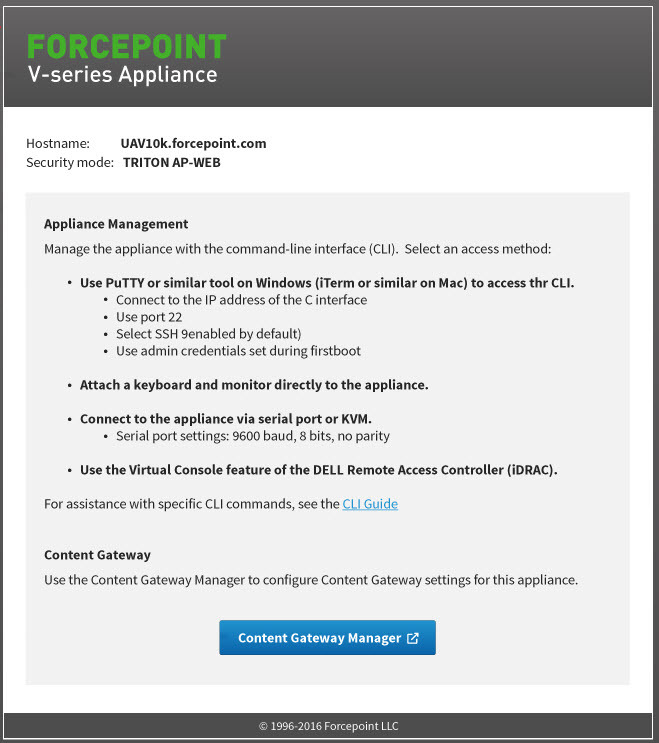 In version 8.3, the V-Series Appliance Manager is replaced by the Forcepoint Security Appliance Manager. The Forcepoint Security Appliance Manager will be released in 2017. These release notes will be updated when the Forcepoint Security Appliance Manager becomes available. Until then, TRITON appliances can be fully and completely configured and monitored with the Command-line interface (CLI). And, of course, the CLI remains available after the Forcepoint Security Appliance Manager is released. A special document is available that maps V-Series Appliance Manager functions to CLI equivalents. See the V-Series: Visual Primer for CLI v8.3 (PDF). 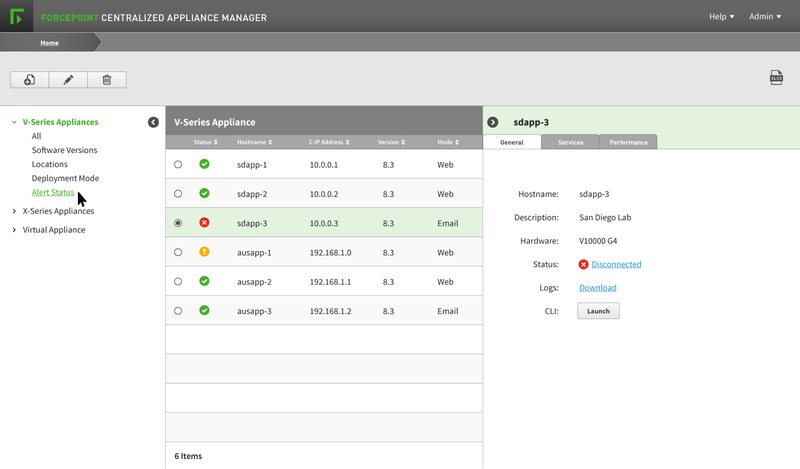 In v8.2 and earlier, V-Series appliances provided a logon portal to the Appliance Manager and Content Gateway Manager (TRITON AP-WEB). The portal could be accessed directly in a browser or, if the appliance was registered in TRITON Manager, via a single sign-on link. If at all possible, do not change the appliance management interface (C) IP address of your appliance. What is affected and what must be done depends on the configuration of your appliance. If your appliance hosts TRITON AP-EMAIL and you must change the C interface IP address, follow the procedure in the Changing the C Interface IP Address technical article. If your appliance hosts TRITON AP-WEB, changing the C IP address requires a full reinstall (re-image) of the appliance. See the knowledge base article How to restore a V-Series or X-Series appliance to a v8.3.x factory image. The set interface ipv4 command allows you to change the configuration of any available network interface, including the C interface IP address. In version 8.3, it is no longer possible to rerun firstboot after it has successfully completed. However, every setting except the security mode, can be updated in the CLI. To change the security mode (TRITON AP-EMAIL, TRITON AP-WEB, Web Filter & Security), the appliance must be re-imaged. Content Gateway Manager 2-factor authentication is supported, however, when Content Gateway is on an appliance, you must contact Technical Support for assistance with disabling direct logon. Coming in 2017 is a completely new, web-based GUI interface—the Forcepoint Security Appliance Manager. The Forcepoint Security Appliance Manager is a single, centralized management console for all models of TRITON appliances in your deployment. It will be located on the TRITON Management Server and integrate with TRITON Manager. Forcepoint Security Appliance Manager will be available in 2017. Below is a small introduction to the CLI. For complete details, see the TRITON Appliances CLI Guide. See also, the V-Series: Visual Primer for CLI v8.3, and the CLI Command Comparison Table 8.2 to 8.3. Depending on appliance model, there are several ways to connect to the appliance console and, hence, the CLI. Once connected, the console presents a logon prompt. Log on with the admin credentials. All appliance platforms can connect to the appliance console with SSH. You can enable SSH access via the CLI through one of the other access methods for your platform. Use the following command in config mode to enable SSH. To connect with SSH, on a Windows system use PuTTY, or similar. On a Mac system use Terminal. Connect to the appliance management interface (C) IP address on port 22. All X-Series appliances and most V-Series appliances supported with v8.3.0, have an integrated DELL Remote Access Controller (iDRAC). Log on to the iDRAC and go to Overview > Server. In the upper right Virtual Console Preview area, click Launch. Connect a monitor and keyboard directly to the appliance. Use the Console feature of the vSphere Client. In vSphere Client, select the virtual machine, open the Console, and click into the window to give it focus. The CLI has 3 modes. The default mode. Used for displaying status and settings. The mode required for changing settings and enabling/disabling options. The mode used to perform troubleshooting. It includes system and network diagnostic commands. Typically, verbs such as show, set, and save are used to view status or statistics, to change the configuration, and to initiate actions. set system is the command. --date is the parameter, which takes a value in the format yyyy/mm/dd. Assistance is built into the CLI. There are 4 ways to get assistance. Use the help command to access help information at any level. Use the question mark character (?) to display help information for the current command path without pressing Enter and without losing the current input. Use the Tab key to auto-complete command elements, or to display a list of available keywords or phrases to complete a command. Use the up arrow key to display the previous command. Several commands have been added to the CLI for version 8.3. For a comprehensive list of all CLI command changes between v8.2 and v8.3, see the CLI Command Comparison Guide 8.2 to 8.3. In the new TRITON Appliance architecture, all configuration, management, and troubleshooting functions are supported by a REST API that is used by all TRITON appliance platforms and Forcepoint solutions. The TRITON Appliance CLI uses the REST API, as does the Forcepoint Security Appliance Manager. In 2017, portions of the API will be published for customer use. In version 8.2 and earlier, the V-Series Appliance Manager was used to move files to and from an appliance. In v8.3, CLI commands are used to move files to and from an appliance, as well as when saving a file. Only system backup files can be saved locally, on the appliance. Therefore, a remote filestore location must be defined to facilitate working with files in the off-appliance location. You can define one or many filestores. The supported file transfer protocols include ftp, tftp, and samba. A unique name, known as the filestore alias. The IP address of the filestore host and the port on which to connect. The protocol to use to move files between the filestore and the appliance. The directory path (ftp, tftp) or share (samba) on the host. If needed, the name of a user (account) with permissions on the filestore. X-Series appliances add a C network interface dedicated to TRITON management communication. In versions 8.2 and prior, TRITON management traffic was handled on interface P1. Adding the C interface separates management traffic onto a dedicated channel, and makes X-Series platforms consistent with other TRITON appliance platforms. Adding the C interface impacts X10G appliance upgrades to v8.3. Prior to applying the v8.3 upgrade patch, administrators must apply Hotfix830 and then configure the C interface in the CLI. The configuration data is stored until the upgrade is applied at which time the interface is added. For complete upgrade instructions, see the X-Series Upgrade Guide. The following new web protection features are supported on TRITON appliances. See the v8.3.0 Release Notes for TRITON Web Protection Solutions for details. Administrators can create scripts to import threat intelligence from third-party sources into TRITON AP-WEB. If you have linked your TRITON AP-EMAIL channel with TRITON AP-WEB, then both can benefit directly from this functionality. See the section titled Management API (Appliance or Linux deployments) in the v8.3.0 Release Notes for TRITON Web Protection Solutions. Supported with TRITON AP-WEB on V10000 appliances. When Content Gateway is enabled to decrypt HTTPS traffic for content analysis, the decrypted content can also be sent to a physical network interface to allow a trusted service to inspect the data for its own purposes. Note that the trusted device cannot modify the decrypted traffic and inject it back into the data steam. For more details, see the section titled SSL Decryption port mirroring (Content Gateway) in the v8.3.0 Release Notes for TRITON Web Protection Solutions. In version 8.3, customization of block pages hosted on appliances is facilitated with appliance API calls that download and upload your customized block page files. For comprehensive details, see the Creating Custom Block Pages technical paper. All TRITON appliances in TRITON AP-WEB deployments that configure Policy Broker replication automatically fail-over to a backup Policy Broker instance in the event that the primary Policy Broker becomes unavailable. No special configuration is needed. This release addresses the following Common Vulnerabilities and Exposures. All TRITON appliances share common operating and maintenance procedures. All TRITON documentation, including documents specific to TRITON AP-EMAIL, TRITON AP-WEB, Web Filter & Security, and TRITON Manager can be accessed at support.forcepoint.com/documentation.